Rescuers struggled to drain a flooded cave in Thailand on Wednesday where 12 children and their football coach have been trapped for days, as monks chanted prayers for the boys. Thai rescuers carry hose to the Tham Luang cave to pump out water at the Khun Nam Nang Non Forest Park in Chiang Rai on June 27, 2018, during a rescue operation for a missing children's football team and their coach. 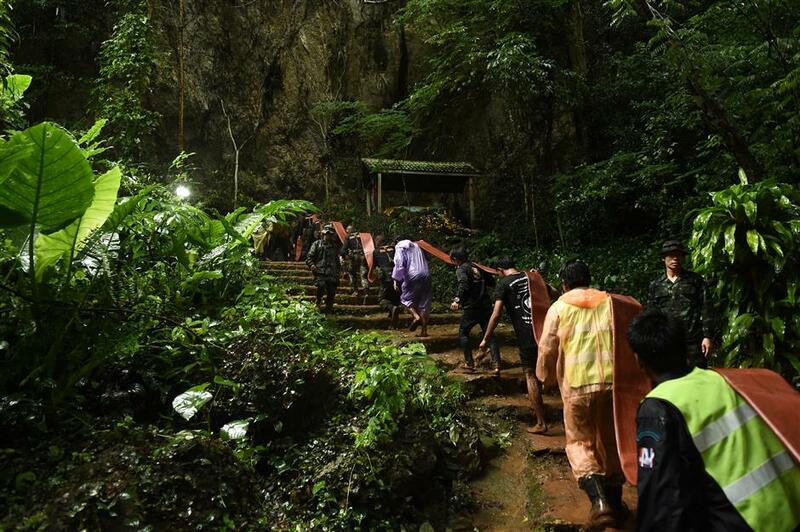 The young football team, aged between 11 and 16, have been stuck in the Tham Luang cave in northern Thailand since Saturday night after monsoon rains blocked the main entrance. Hundreds of rescue workers worked overnight to install high-pressure water pumps to reduce flooding in the cave, but it was a losing battle as rains continued to fall in the area near the Laos and Myanmar borders in northern Chiang Rai province. "Today's work is much harder, we are trying hard to drain water by pumping out but the water level is still rising," provincial governor Narongsak Osottanakorn told reporters. Conditions in the cave also proved tough for the 200 rescuers dispatched into the tunnels to find the boys. "The water inside the cave is very murky, and there's not much oxygen," Narongsak said. The governor said three foreign cave-diving experts would arrive on Wednesday evening to aid the harrowing search that pressed into its fifth day Wednesday. Around 1,000 people had been mobilized for the rescue efforts, including air and ground teams and divers. The Army also dispatched special operation troops to aid the rescue. Thailand's Navy SEAL unit said on their Facebook page that water levels rose 15 centimetres overnight and that a third chamber of the complex cave network — believed to be several kilometres long — was now flooded. Soldiers carried large hoses to attach to eight water pumps that were shipped in to drain rising flood waters. Monks in bright orange robes led chants alongside distraught relatives who clung to hope the boys would be rescued soon. "I hope that today with the help from all teams he will be saved. I'm certain in my heart," Pean Kamlue, the mother of a 16-year-old boy in the cave, told AFP. The dramatic rescue operations have captivated the country and prompted emotional outpourings on social media and from the country's top leaders and royal family members. Officials found three new openings on Tuesday, but only one was accessible and they planned to shuttle rescuers and food in through the hole by air. But heavy fog and strong winds grounded five helicopters that were on standby in the area. The young football team, called the "Boars," and their 25-year-old coach are familiar to the area and know the cave well, officials said. They went into the cave after football practice on Saturday and a mother of one of the players alerted authorities when her son did not come home. Bicycles, shoes and backpacks belonging to the footballers were found near the cave's entrance, and divers said they discovered footprints and handprints inside one of the chambers on Monday. A sign at the site's entrance warns visitors not to enter the cave during the rainy season from July to November. Forecasters said light rains would continue to fall Wednesday, though downpours were not expected to be as heavy as they were overnight. Thailand's Deputy Prime Minister Prawit Wongsuwan said Wednesday he was optimistic the boys would be saved soon. "I have high hopes that we will find those 13 people because so many days have passed," he told reporters.